Of course you want your website to look good - that's a given - but the bottom line is that it needs to perform. It must perform well in the search engines and on your customer's laptop. It must convey your brand attributes and define your value positions clearly. It should be so deceptively simple that even the proverbial grandmother can use it. And it must generate sales. This is my approach to website design. I don't have stock templates or a catalog of recycled clip art to rely on. Every client is different and therefor needs an plan that is perfectly aligned to their branding and marketing goals. That means your website will not look like the sample below because your needs are different. So if you are looking for practical solutions to online marketing from a branding perspective, and you want someone who's been consistently capturing first page positions in the search engines since well before Google became a verb, then I'm your guy. 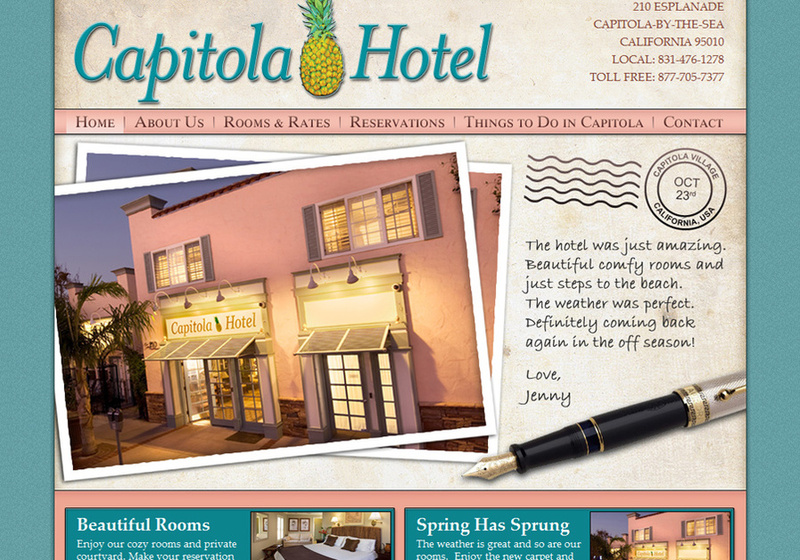 Redesign for Capitola Hotel in Capitola, California. Capitola is a world renowned beach town and tourist destination. I created a "travel postcard" theme that captures what their visitors are seeking - a fantastic get-a-way adventure. The content was minimal so I used large images and fonts and generous white space to create a well balanced user experience. The site was designed from the ground up to perform well in the search engines - you could even say it dominates. Client had a pre-existing third-party hosted reservation solution that worked well but was difficult to style as the supplier puts very tight limitations on what you are allowed to do.